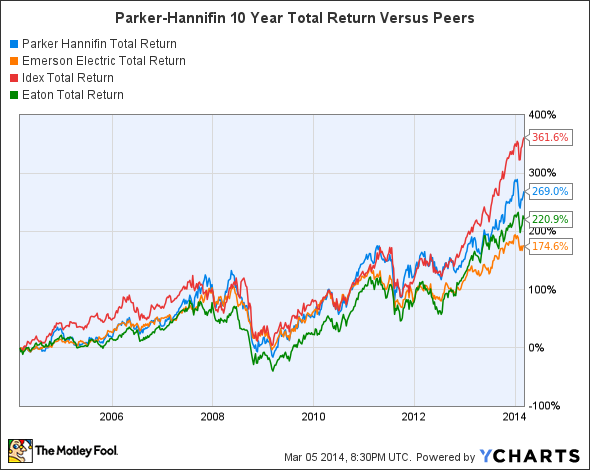 Is Parker-Hannifin Corporation a Dividend Beast, Backslider, or Bust? Parker-Hannifin Corporation, the diversified manufacturer of engineered motion and control technologies, is known for a mean streak of dividend increases. Should you invest? Parker-Hannifin Corporation (NYSE:PH), a $13 billion global manufacturer of motion and control technologies, is renowned among dividend investors for its 57 years of consecutive annual dividend increases.While only a smattering of S&P 500 companies can boast the same track record, you shouldn't buy a company based on the perceived stability of its dividend alone, regardless how impressive the streak. In this series, we scrutinize popular dividend stocks to determine if a particular favorite is a dividend beast, backslider, or bust. 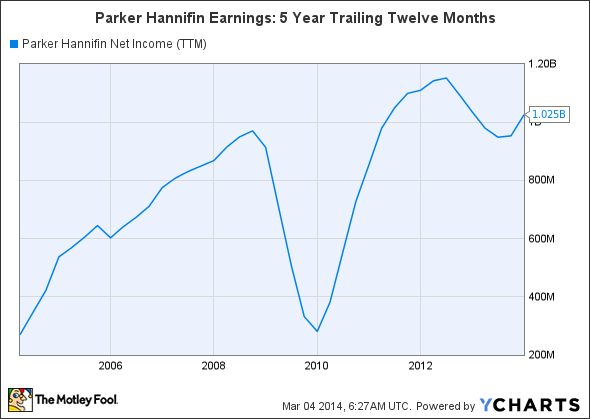 Let's delve into Parker-Hannifin's business to see how it measures up. Parker-Hannifin provides engineered products and solutions across multiple industries, ranging from simple brass and steel couplings to hydrogen fuel cells for jet engines. The company focuses on nine major technologies: aerospace, climate control, electromechanical solutions, filtration, fluid and gas handling, hydraulics, pneumatics, process control, and sealing and shielding. While its fundamental components such as piping, coupling, and tubing are purchased by a wide range of companies, Parker-Hannifin also brings great expertise to higher-end engineered products, including the "CNG natural gas dispenser," which was designed as a fuel dispenser for natural gas powered vehicles in India. The company has placed roughly 500 of these fuel dispensers in India, and it plans to expand the CNG dispenser throughout Asia in the future. Parker-Hannifin also supplies fuel and hydraulic systems to the Airbus A350 XWB, a fuel-efficient composite aircraft, and is producing a fuel cell-powered auxiliary jet engine for Airbus, with the first prototype due within one to two years. Because the company is so widely diversified, with the great majority of its products tied to the success of the manufacturing sector, Parker-Hannifin's management follows the Purchasing Managers' Index, or PMI, as a forward indicator of its future order rates and earnings potential. It also tracks aggregate statistics on global aircraft miles flown, as well as North American housing starts. Parker-Hannifin follows these three major indicators pretty seriously; current numbers are usually included in PH's quarterly SEC filings, and company executives frequently discuss changes in the indicators during earnings conference calls. The close correlation between its order rates and these few key indicators bulks up PH's predictive muscle relative to its revenues and earnings. At the same time, the range of Parker-Hannifin's products over so many manufacturing disciplines, coupled with its footprint in 49 countries, means that the company has a high degree of sensitivity to the health of the global economy. In the chart above we see a valley formed by a massive earnings dip between 2009 and 2011, in the thick of the global recession. We can also see the vigor with which earnings bounced back as economic growth rates around the world recovered from negative to slightly positive territory. Are cash flows ample enough? Companies with long-lived dividend streaks by necessity must maintain vigorous cash flows quarter after quarter, a characteristic evident in Parker-Hannifin's operations. For the six months ended Dec. 31, 2013 (the first two quarters of the company's 2014 fiscal year), Parker-Hannifin generated $540.1 million in operating cash flow, from $6.3 billion in net sales. This was more than enough to cover $134.7 million paid out in dividends, reasonable share repurchases of $103.7 million, capital expenditure of $111.8 million, and debt repayments of $115.5 million. It should be noted that the company received an additional net cash boost during the period of $202.5 million from the sale of 50% of a wholly owned subsidiary to GE Aviation. With manageable long-term debt (the company's debt to equity ratio is currently 43%), cash flows should provide an ample base for continued dividend increases in the near future, provided that business conditions remain relatively stable. Because cash flows are so important to "dividend streak" companies like PH, it's reasonable to get a sense of how such companies are valued relative to the cash they generate. Using the "Price to Free Cash Flow" ratio, we can compare Parker-Hannifin to bona-fide dividend beast and competitor Emerson Electric (NYSE:EMR), along with industry competitors Eaton Corporation (NYSE:ETN) and IDEX Corporation (NYSE:IEX). This ratio measures a company's price relative to its operating cash flow less capital expenditures. 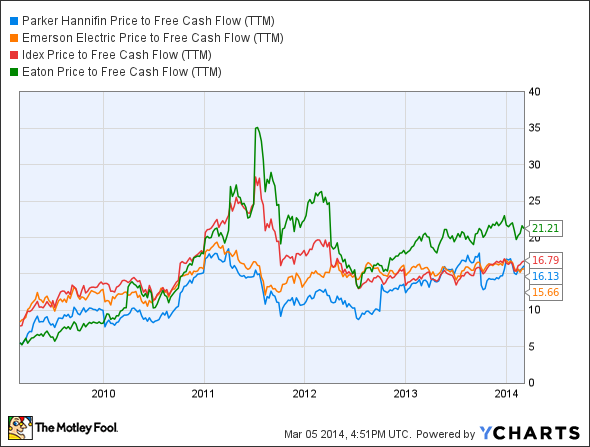 As a multiple of free cash flow, Parker-Hannifin's valuation is in line with its peers. Coupled with the company's moderate P/E ratio of 17.7, investors should possess a comfort level that the stock is reasonably valued vis-a-vis cash flows and earnings. The risk inherent in owning a company like Parker-Hannifin is that due to its broad swath of competencies and markets, chances increase that at least one business segment will badly trail other segments at any given time, with the potential to affect earnings. This is the flip side of admirable diversification. Similar to competitor Emerson Electric, Parker-Hannifin is not afraid to trim underperforming assets and take a near-term charge against earnings when management identifies a weak division. In the company's second quarter of fiscal 2014, it recognized a gain of $413 million on the sale of its subsidiary interest (mentioned above) to GE Aviation. Management took advantage of the cushion provided by this one time gain to restructure an underperforming division (Worldwide Energy Products Division), incurring $183 million of asset impairment and intangible asset write downs. Parker-Hannifin, like peer Emerson Electric, is a dividend beast. With its wide exposure to long-term global economic growth and strong cash flows, the company has delivered impressive total returns to its shareholders. Though the global economy is still expanding gingerly, holding PH stock and reinvesting dividends for at least a three- to five-year period should reward the patient investor.